I had been thinking that it was time to make a new ballet animation with a new ballerina. 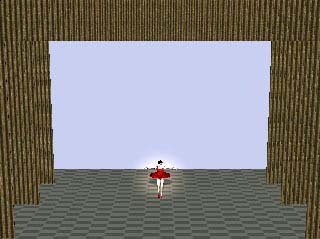 My last ballet animation was made with Swivel 3D Pro. The ballerina can be seen in Fig. 1. As you can see, she is not particularly attractive and the joints look as if they were on a wooden marionette. This is a canned figure that came with the program. It was the "Barbie." Her partner was the "Ken." I changed her hair, made the headpiece, the tunic, and the tutu and did the animation all in Swivel 3D Pro. I have since graduated to the modeling program Ray Dream Studio 5 and the animation programs Poser 3 and Poser 4. (All of these programs are now "out of print.") My work at an earlier stage on the new ballerina can be seen in Fig. 2. Note that the tutu, the leotard, and headpiece are bright red in the original picture. Also note that this ballerina is considerably better looking than the first one! This is a canned figure that came with Poser. The leotard also came with the program. I made the headpiece and the tutu. (Interesting side story: We were at a group dinner recently. I was describing my latest venture into animation to my next seat neighbor. I mentioned that I had just made the tutu for the ballerina. A neighbor further down the table, apparently coming in late in the conversation, said, "Oh, do you sew?") The missing ballet shoes were modeled later. The rest of this piece will describe in fairly low-tech (I hope) how this creature and the stage were created. Ray Dream is a modeling program. Modeling is the creation of 3D objects. The program can also do animations. 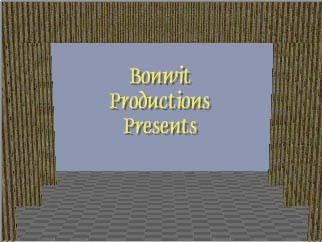 However, since I use figures and some objects from Poser, I do my animation in Poser. Poser is NOT a modeling program; you cannot create objects or figures in Poser. 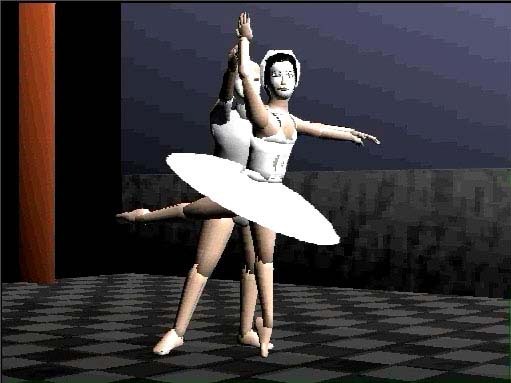 However, objects created in Ray Dream can be imported into Poser. Poser is an amazing program with a wide variety of figures, human and animal, a variety of clothing for the figures, and a number of objects (props) - all loaded with the program on the hard disk. More figures and objects are available on the program CD. The clothing for the figures can be made to "conform" to the figures. This means that when the figure arms, legs, and body move about, the clothing comes along with them in a natural looking way. Poser does this by incorporation phantom body parts inside the clothing. These phantom body parts match the corresponding figure body parts and move with them. In a previous animation my animated opera diva needed an appropriate gown. There was only one dress in the Poser collection that came close. Poser has no clothing appropriate for a ballerina. The software house Zygote made the orignal figures for Poser. Zygote also sells a very large number of figures, objects, and clothing that can be used in Poser. However, they have no ballet costume. The tutu in Fig. 1 has as its "parent" the figure's hip. This means it is attached to the hip and moves with it. 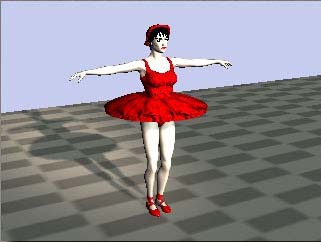 If the ballerina leans forward, her hip (that is, the portion of the body called the hip in Poser) rotates and the tutu rotates with it. One problem: the tutu is a solid block. It might as well be made out of concrete! When a ballerina moves about, particularly in jumps, the tutu should flit up and down and even flutter. Not with the concrete block! By comparison, the movie Shrek has animated clothing that flows and ripples most naturally. Jealous, jealous!! I created the tutu in Fig. 2 that is "flexible." It is made of 30 separate elements whose parent is the figure's hip and are free to move up and down independently. An element is seen in Fig. 3. 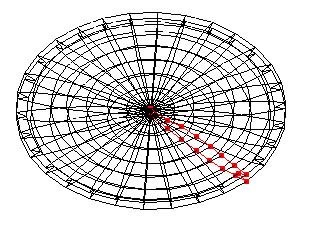 It was created in Ray Dream starting with the zig-zag line and extruding a shape forward (perpendicular to the grid surface). The near end was squeezed down. This element was duplicated to make the 30 elements. One may note in Fig. 2 that certain details of the figure's body shape are not quite appropriate for a ballerina. 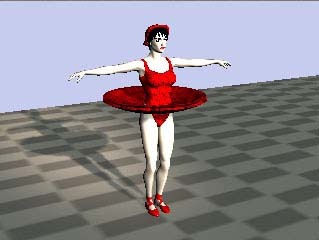 In Poser the figure's body can be corrected (er, changed). However, the leotard, which imitates the body's uncorrected shape, cannot. Sorry! 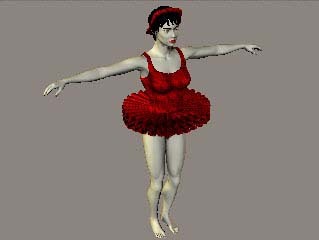 The more I thought of having to move (animate) 30 pieces of the tutu to simulate flexibility, the more I thought I'd never get done. (A common problem in animation!) So, I made a solid (concrete?) tutu seen (in a much later stage of development) in Fig. 4. This was made in Ray Dream as seen in Fig. 5. A cross-section was drawn: the dots in the figure. The cross-section was then swung around a vertical axis in the process know as lathing. You say, "What about a hole in the center for the ballerina?" In 3D modeling one of the laws of physics is disobeyed: two things *can* occupy the same space at the same time! In Fig. 4 the tutu has no hole, but you can't tell. And, besides, who will ever know? I thought that, since Poser has "morphing," i.e. 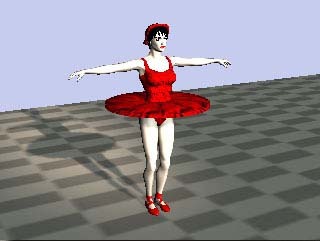 shape changing in animation, capability, I could _just_ morph the tutu to exhibit flexibility. It turns out that all the morphing instructions in the Poser manual referred to morphing parts of human or animal figures. There was no mention of morphing props, items introduced into the animation that are not figures. The tutu is a prop; the headpiece on the ballerina is a prop. I created a near copy of the tutu curved upward as seen in Fig. 6 and "duplicated by symmetry" to make the tutu curve downward as seen in Fig. 7. With a single click I can make the tutu look like any of the three pictures. That sure beats having to manipulate the 30 elements mentioned above! The shoes in Fig. 4 are canned in Poser as "dress shoes" and if nobody looks too closely, I say they are ballet shoes. The ankle straps are "texture maps" the making of which is enough for another whole story. The floor design is another texture map. It was made from a grid pattern I made for another purpose. I filled it in with a medium gray in a checkerboard fashion, duplicated it several times, and "tiled" it into the texture map. The balcony view of the stage is seen in Fig. 8. The curtains were made in Ray Dream similar to the making of the tutu in Fig. 3. A zig-zag line was drawn and the shape was extruded. 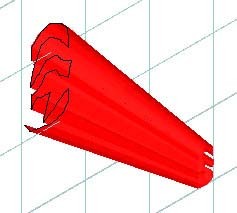 A long extrusion produced a side curtain element and a short extrusion produced a top curtain element. The elements were duplicated to produce the width of the curtains. The stage lighting had a problem: the stage lights cast horrible shadows of the curtains across the stage. Poser fortunately has a solution: lights that cast NO shadows! You may notice in Figs. 4, 6, 7, and 8 that a spotlight plays on the ballerina. It can follow her motions. The house lights dim; the opening credits appear - Fig. 9. All I gotta do now is the animation!